There are four steps in ensuring your wishes are carried out with writing your Will the first. The second is ensuring the document is stored safely, hopefully for many, many years. It should be storage away from home, to protect you and your family against the possibility of loss or damage through fire, flood, burglary or even fraud, by a disgruntled family member. All our clients are provided with safe storage and insurance for their lifetimes. The third step is keeping the will up-to-date and ensuring it is reviewed regulary and the fourth is the final stage and involves in dealing with Probate and the Administration of your estate passing everything to your next of kin with the minimum of fuss and expense. 1. 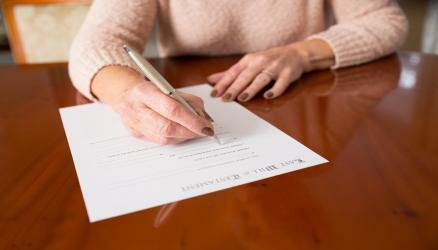 Writing your Will, once this step is completed, a small annual fee will help to ensure steps 2 - 4 are taken care of, with the minimum of inconvenience to yourself. Same Day document retrieval. So if anything happens, your documents are stored in the same building as our probate department, enabling us to advise your next of kin straight away. 3. Keeping your documents up-to-date is hassle free. Circumstances will change many times during your lifetime for you and the people in your will. You or someone in your Will may move, have children or grandchildren. Your spouse, executors or guardians may pass away, fall out, marry or divorce. As your children mature they will have children of their own and you will wish to include gifts to your grandchildren. If you have daughters or other female beneficiaries in your Will, they may marry and change their name. you may wish to include gifts to special people or charities which have shown you kindness or have help you in a time of trouble. Everything is stored on our secure servers and available to the staff who can make changes. No need for you to take time off work. You can email, write or telephone. Documents are delivered, explained and the signing is supervised. All estates over £5000 have to go through a legal process through the Probate Courts. When the time comes to deal with your affairs, you annual subscription pays for one of our probate specialists to visit your next of kin, to read the Will, and advise them on how the modern legal process works, without them having to appoint a solicitor. This potentially saves them many thousands of pounds. The extensive forms for the Money Laundering Act, Identity Theft, the Probate Court, Inland Revenue, the Department of Work and Pensions and the Capital Taxes Office will all need to be completed. We will explain all legal obligations and options. If requested, we will settle Funeral & other debts within 24 hours. Your home will be secure and insured. Personal possesions are dealt with by people you appoint, not us unless you specifically request. Up to a quarter of the cost of your local solicitor. Without this benefit, your next of kin may need to approach a solicitor. With the average Solicitors bill for probate work during the last three years being around £11,000, this facility will save then a consideral amount of money. 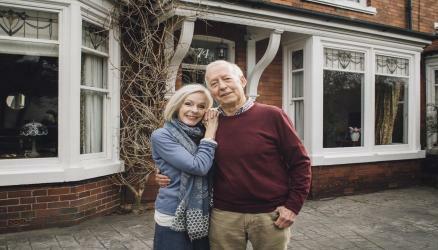 For more complex wills, involving inheritance Tax planning or protection against Nursing Home Fees, solicitors charges will be considerably higher. *As you can imagin, the costs involved in running an office and retaining staff to help all of our clients is substantial. All updates are free of charge for clients that continue to pay the annual subscription. In the event of cancellation during or after an update has been produced, then the company will invoice for the work done. On death all charges are normally waived if our probate team is appointed to deal with the legal work, otherwise an invoice will be raised. I hope it is not for a long time, but when the time comes to deal with your affairs your next of kin will telephone to inform us and request advice regarding the funeral requirements and what they have to do. We will help with all immediate concerns then arrange for them to sit down with one of our professional probate specialists - the same day if required. At the meeting we will read and explain the Will in plain English and fully advise them of their legal obligations and choices of how to proceed. They can deal with everything themselves. A high percentage of the people we see ask us to deal with the legal work as we offer a quality service that is up to a quarter of the potential costs of your local Solicitor or Bank. In particular, those that protect your home against Nursing Home Fees and Inheritance Tax. It is imperative that all clients with this type of Will keep the original documents with us and pay the annual fee, because there are more potential problems and higher costs involved in dealing with these documents. 1. These documents cost a lot more than simple Wills – up to £1000 with us and even more with a solicitor. It is even more important they are kept up to date – every time you move for example, they will need to be amended – you will not have to pay us again if you pay an annual fee. 2. This type of Will leaves your share and interest in your property to your chosen beneficiaries. If the Wills is “lost” or damaged, this will not take place. There have been many instances where, after death, the Will has been “lost”, sometimes deliberately, and the surviving spouse has inherited instead of the intended people in the Will. This is particularly important where there are foster or step children involved in a relationship. 3. These types of Will have to pass through probate twice, on first and second death. We have seen solicitors bills in excess of £3500 on each occasion where our clients have appointed a solicitor. 4. After first death these Wills have to be amended. After all, they give a share of a property to somebody who is no longer alive to receive it. 5. The Land Registry and Inheritance tax laws changed four times 2003-2007. We kept or customers up to date with the changes, and made alterations where necessary, without further charge and with the minimum of inconvenience. Subscribing clients receive discounts on all services including probate, Lasting Powers of Attorney and when up-grading Wills to include something which normally attracts a charge. For example, a Will that protects your Property against Nursing Home fees costs a lot more than a simple “everything to each other, then to the children” type Will. The law regarding the three page Enduring Powers of Attorney changed in 2007 when they were replaced with a new Lasting Powers of Attorney document. Solicitor’s average charge for each document is £1200. Our subscribing customers pay from only £99 plus VAT.